We all like a good list. Recently we did a rather nice one to guide you through the steps of spotting a bad romcom. But, I suppose, when you work for The Guardian, it's a different ballgame. Hence their decision to publish their inaugural Film Power 100, a list defined by the paper's 'Thinking Behind The List' article as a guide to people who 'shape the exper­ience of film viewing in the UK'. The problem with the list is that, well, it's a little controversial and more than a little ambiguous. The Guardian doesn't really help itself by claiming in it's explanation of the 100 that 'it's not definitive. There'll be people we've missed, people we've rated too high, ­people we've rated too low'. Quite. But the problems with the list extend further than that. For a start, some choices seem particularly ill-judged. Take Number One, an easy target if ever there was one, a Mr James Cameron. Sure, he's a self-proclaimed 'king of the world' and he directed the two highest-grossing films of all time but he's hardly prolific (there's 12 years between those two films) and his choices in the between time have hardly influenced the cinematic landscape. Aliens Of The Deep, Ghosts Of The Abyss or Expedition: Bismark anyone? Thought not. Then there's the second choice; Steven Spielberg. Another high-profile, high-grossing director in a list which claims to be more than just a 'guide to the richest people in film, or the ones with the greatest green-lighting power'. Fine, you might think; 'the first and second ones are Hollywood royalty: it's a conincidence'. But look at Number 3: Leonardo DiCaprio. And, erm, Number 4: John Lasseter. And, knock-me-down-if-you-can't-swing-a-cat-without-hitting-a-Hollywood-figure: Number 5 is Brad Pitt. In fact, the only figure in the Top 10 who isn't a Hollywood star is a politician (Ed Vaizey, who squeaks in at Number 10 due to his position as Secretary of State for Culture, Communications and Creative Industries) and we're not going to start on how the hell he got in there. How about another quote from the section which explains what this list is and isn't, just so we're in no doubt that we're not reading a rich list; 'nor is [the list] a run-through of Hollywood moguls'. Oh right, well, that's OK then. There are other problems with the list though, above and beyond it being a rich-list in disguise. Take for example the fact that there are no Black or Asian figures. Are we really saying that Samuel L Jackson has ceased to be a bankable star? Or that M. Night Shyamalan isn't guaranteed to get people talking, therefore influencing what they see? Armond White is primarily an American critic but surely, his press coverage extends to influencing UK cinema-goers? And whilst we're on critics, who's the top person not directly-related to the production of films? Col Needham, the creator of IMDb, here listed as a blogger. How many times must this be said to mainstream publications: just because someone owns a website, they are not automatically a 'blogger'. The 'real' top blogger or critic by the way is Harry Knowles (53), placed significantly above compatriots Mark Kermode (75), Roger Ebert (81) and James King (94), despite the later three's considerable reach and the fact that I have never heard the words, 'lets see this, Harry Knowles likes it!'. These three list-latecomers are also, by the way, eclipsed by Claudia Winkleman (62) who is yet to even start her job as the regular host of Film 2010 and about whom the increasingly self-depreciating list notes 'the jury is out, as yet, on how much influence she'll wield'. Increasingly, as more and more errors, omissions and inaccuracies popped out at me I found myself thinking, 'just stick to producing a rich list guys', which, actually, when you delve into a Top 100 that features people like Rupert Murdoch, Brad Grey and Jeffrey Katzenberg, is exactly what they've done. A) From the UK originally? B) Still active in the UK film industry? I could probably look that up myself, but I'm feeling a bit lazy :P.
I think that's another really good point. Just glancing through I can see some UK faces but I suspect they are far outweighed by American ones. Up to a point you have to ask how much that is the list's fault and how much that is down to what the average UK filmgoer watches. But still, even if that is the case, I would prefer to see some optimisim about the UK industry in a UK list by a paper which has a history of being very supportive of UK film. it depends what 'power' we're talking about. Kermode, King and Ebert can't green-light a production in the first instance and their audiences are very different too. IMDB co-founder controls very little. Yes, I guess he could completely blitx the site with advertising for a film and inevitably that would reach a huge target market ... but that doesn't happen. 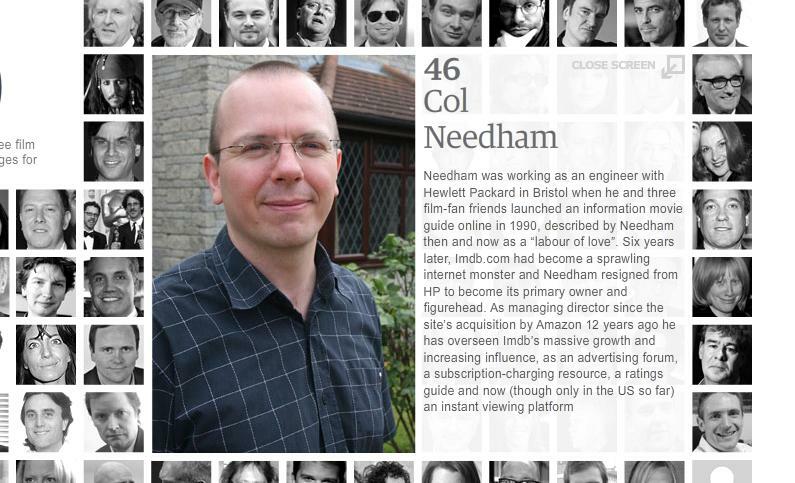 I don't look at IMDB - or moreimportantly Needham - for influence on my taste. I think that is a key problem with the list: it's too difficult to define what 'film power' is and the guardian hasn't successfully done it. A list of 'people with most greenlighting power' or 'most influential critics' would have more merit than attempting to lump them all together. Your marketing company point is a good one as is the one about IMDb. I use the site for information about films I already know about, something which I imagine is reflected in its general user base. Okay, so this post is years old, and I only stumbled upon it while looking for more info on the man behind IMDB -- but still, I couldn't resist comment. You protest the absence of M. Night Shyamalan in a list of people who "shape the exper­ience of film viewing in the UK". Perhaps a glance at the public opinion of his works would be in order. The ratings provided by IMDB make for a handy barometer. Admittedly, you wrote this in 2010, so I can forgive your not knowing that he would make After Earth (4.8). Heck, I'll even give you The Last Airbender (4.4), despite its having been released several months before you wrote this. Perhaps its awfulness hadn't yet sunk in for you. But still, a look at his earlier works clearly shows that he's not really a mover and shaker, and never has been. In fact, he's closer to being a cinematic one-hit wonder; his entire career revolves around a small part of just one film. Were it not for "that twist" 14 years ago, he'd almost certainly have remained a nobody. Sure, The Sixth Sense (8.2) caught us all napping. The water cooler loved it. And Unbreakable barely squeaked through with a generous 7.2 as well, although the hamfisted "surprise" endings were already starting to lose their appeal. But before those, he'd checked in on Praying with Anger (4.9) and Wide Awake (5.8). And afterwards, he didn't waste much time in returning to his earlier form. Signs (6.7) was received with exceptional kindness, if you ask me. I gave it a more realistic 4/10. Later films like Lady in the Water (5.6) and The Happening (5.1) confirmed my opinion that he'd peaked with his first real feature, and had resorted to phoning it in from that point onwards. And it's not like he can blame the scriptwriters or cast for these flops. He wrote them all, and directed the lot. The buck has to stop with him. In fact, the big question is why anybody kept letting him come back for another lesson in mediocrity -- and a de rigeur Surprise Plot Twist (tm) -- in the first place. What, precisely, did the public expect for its money? It certainly wasn't an entertaining film. Even the great unwashed would've figured it out by now. The truth of the matter is that Shyamalan hadn't made a single thing worth watching in a decade and change when you wrote this -- yet you decry Cameron's 12 years between hits. Love him or leave him, at least Mr. Cameron knows how to surrender the stage until he has something of value to say. And you bemoan Shyamalan's absence from a list of movie heavyweights, years after most of the world realized the pony had only one trick. In the process, you neatly demonstrate the problem in your own mockery of The Guardian's list. It is all subjective. Your own choices make no more sense than did theirs. Armond White? Never heard of him, and I say that as a movie buff Brit who had been living in the States for a decade when you wrote this blog piece. I can guarantee the average Brit has never heard of him either, so why does he belong on a list of those who influence the viewing of Brits? As I read your blog post, the inconsistencies in your own argument popped out at me just as you claim The Guardian's did for you. When you're writing a post snarking on somebody else's work, it helps if you have a point to make, and if you make it intentionally. Here, it seems that the only point made --while enlightening -- was entirely accidental. Three years later, as Shyamalan continues to turn out stinkers -- and has finally been relegated to the wastelands of TV -- your post just makes you look a bit silly. And me equally silly for bothering to reply to it, I'll grant you. But then I'm not the one running a blog proclaiming my own "added intelligence". I'm struggling to see much intelligence added here. Fair points I'm sure, and as you say, all subjective. I still think their list is silly. You don't. I don't think that makes you or I 'silly' but again, that's just an opinion. If I could though, steer you towards the part of the post that mentions Shayamalan, you'll see that it actually only features as an example of a fairly important critique of the list: namely the fact that it features no black or asian figures (which I would have thought was a more important point to focus on), and that his name is included with a question mark, rather than as a statement. It was merely a suggestion, up for debate, as is the rest of this post. That isn't to hide the fact that yes, with three years of hindsight and with a smattering of could-have-still-picked-a-better-example-at-the-time, he probably wasn't the name to mention really, was he? Ah well, thought it was making a point about marginalisation. Apparently not. I can only try. 1. Paragraphs 2-9 of your response can be summed up in one sentence: you really don't like M. Night Shyamalan's films. 2. The fact that you don't like his films is irrelevant, as every film he made bar one from The Sixth Sense to the publication of the Guardian list has done considerably well at the international box office (Lady In The Water is the exception, as it just fell the right side of breaking even). Yes, even critically panned The Last Airbender made lots of money. 3. Your dislike of his films is also irrelevant as the point Sam makes stands regardless: The Guardian's list is overwhelmingly white. Substitute another name for Shyamalan's, such as Ang Lee, and the point still stands. Do you like Ang Lee's films? It doesn't matter. 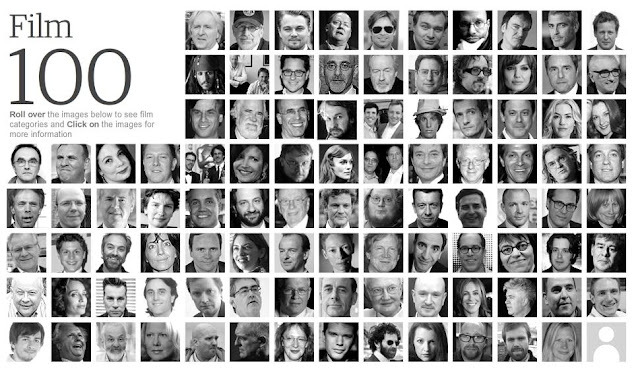 He's a successful and influential non-white figure in film who has been omitted from this list, just like Shyamalan. 4. The rest of your comment seems to just be vitriol against Film Intel as a site, which begs the question why you left such a lengthy comment on a site you clearly dislike. 5. Maybe it's from living in the States for ten years where irony famously often goes undetected, but surely as a Brit you can tell that, when a website owner claims "occasional added intelligence", his tongue is quite clearly in his cheek? If I have the inclination later, I might flesh this out into something more detailed. This will suffice as my response for now at least.